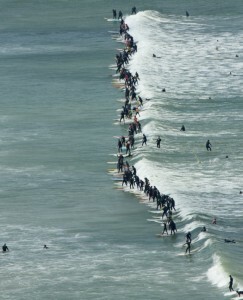 The Earthwave Beach Festival will again host an attempt to challenge the Guinness World Record for the most surfers riding the same wave at Surfers Corner on Muizenberg Beach on the weekend of 25 & 26 September 2010. The fourth edition of the popular festival that harnesses the huge interest surrounding attempts to break Guinness World Records (GWR) to promote sustainable lifestyle choices, will include a national SA Longboard Surfing (SALSA) event and Stand Up Paddleboarding (SUP) races featuring many of the country’s top performers, alongside plenty of fun beach activities, demonstrations and talks on climate change over the two days. “We’re excited about Earthwave 2010 and after setting the Guinness World Record of 110 surfers riding the same wave at Muizenberg last year, we feel that we can raise the record even further,’ says Paul Botha from Kahuna Promotions, the organisers of the festival. The attempt on the Guinness World Record will be made between 1pm and 2pm on Sunday 26 September, with registration starting at 10am, and the SALSA longboard surfing event and SUP races will start on Saturday 25, with the finals on the Sunday morning. Earthwave Brazil, where the Guinness World Record of 100 surfers riding the same wave was set in 2008, will also be making another attempt to break the record on Sunday 12 September as part of a three day professional longboarding and SUP event at Quebra Mar near Sao Paulo. The Earthwave Beach Festival at Muizenberg provides unlimited sponsorship opportunities for companies and organisations keen on promoting their environmental credentials or simply wanting to showcase their products and services to a receptive audience and through the saturation media coverage. See www.kahunasurf.co.za/kp/earthwave for details of the 2009 Earthwave Beach Festival where the Guinness World Record was set.